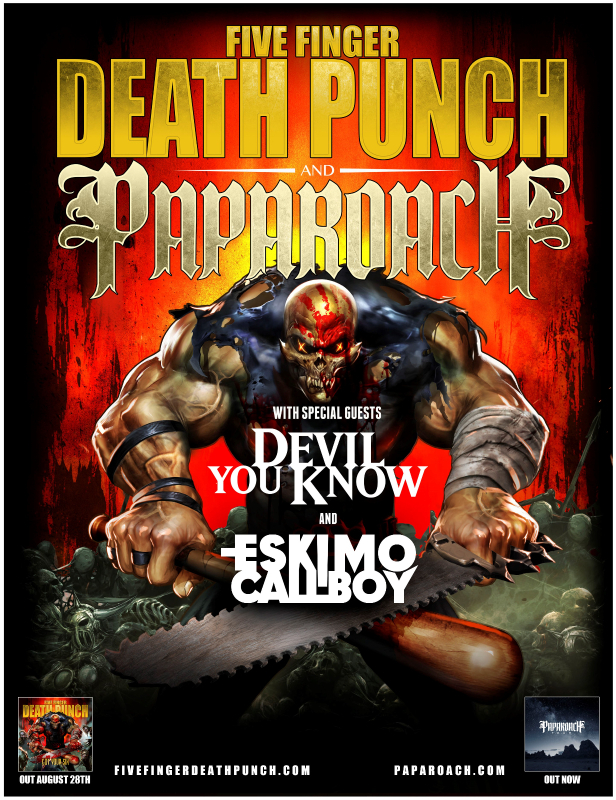 Five Finger Death Punch and Papa Roach will join forces for the first time to co-headline Europe’s biggest rock tour with support from special guest Devil You Know(featuring Howard Jones, ex-Killswitch Engage). The tour kicks off in Helsinki, Finland on Nov. 2 and end in London, UK on Nov. 28 at Wembley Arena. More shows and special guests will be announced at a later date. Zoltan Bathory, guitarist of Five Finger Death Punch notes: “By the time this tour takes off, our new album “Got Your Six” will be out already. This is our best record so far, really just a solid brick of heavy metal, so we can’t wait to play some of these songs to the European fans. This whole tour is going to be just balls to the wall night after night”. Adds Jacoby Shaddix, vocalist for Papa Roach: “We are stoked to rip up the stages in Europe with our brothers in FFDP!!!! Don’t miss it! Papa Roach is gonna be on fire”. Five Finger Death Punch and Papa Roach recently gave their European fans the opportunity to request the tour visit their city via a “demand campaign” housed at housed at http://demand.fivefingerdeathpunch.com/ and http://demand.paparoach.com/. Several hundred thousand people from 19 countries all over Europe responded to the call to action and made their voices heard.